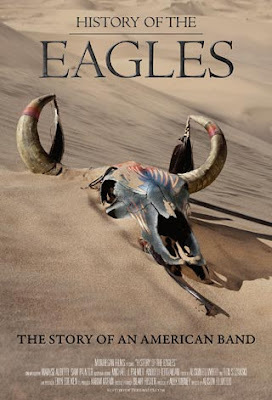 The Eagles are one of those great iconic bands of the 70s, with a discography littered with all-time classic soft rock - Hotel California, Take It To The Limit, Take It Easy - to name but a few. Softer than the Rolling Stones, with a vocal harmony that confirms how far the Mumfords are rip-off merchants, the group seemed to be constantly be pulled between a desire to rock out, and their country, bluegrass hearts. These tensions, combined with ten years on the road, pushing themselves to musical excellence, resulted in a break-up in 1980 that was one more nail in the coffin of the 70s. Alison Ellwood's new documentary is a pretty straightforward, over-long and pedestrian affair. To be sure, it benefits from interviews with all the bandmates, through the groups various iterations, and the key producers, managers and collaborators over the years. I was truly educated as to their musical influences, drive for success, and in particular the crucial songwriting and managerial partnership between Glenn Frey and Don Henley - the alpha dogs whose leadership irked Don Felder so much. It's also always good value to see the vintage footage of guitarist Joe Walsh ripping up hotel rooms and relieving the plainchant on-going tension within the band. The problem with the film is that it's just unbelievably unexciting. It's just a basic linear mash-up of vintage footage and contemporary interviews. It never conveys the excitement, anarchy, craziness of the tour or the passion of the musicians. Watching it, I was often reminded of the music docs I watched last year - not least the Stones doc CROSSFIRE HURRICANE. I had issues with that pic - not least the easy ride it gave the Stones over Altamont - but you can't deny that with its voiceovers and more free-form style, it conveyed more of their energy and gonzo lifestyle than this doc does for The Eagles. We needed a spark of creativity - a sense of the sheer craziness and wonderful energy of that era. And it never came. HISTORY OF THE EAGLES PART ONE played Sundance 2013 and does not yet have a commercial release date.